We love our favorite desserts because they taste amazing. But, we also appreciate these desserts because they look incredible, too. Whether it’s an expertly decorated cake or creme brulee with a perfect sugar crust, sometimes we don’t want to eat these desserts because they’re pretty. Thankfully, that hesitation doesn’t last long. Our recipe for banana pudding with a meringue top is the perfect recipe because it tastes amazing and looks great, too. When you cook it in a glass dish, you can see all of the beautiful layers — creamy pudding, sweet vanilla wafers, and fresh bananas. If you want to surprise your family with a tasty treat or need something to take to a potluck, this pudding may become your go-to dessert! 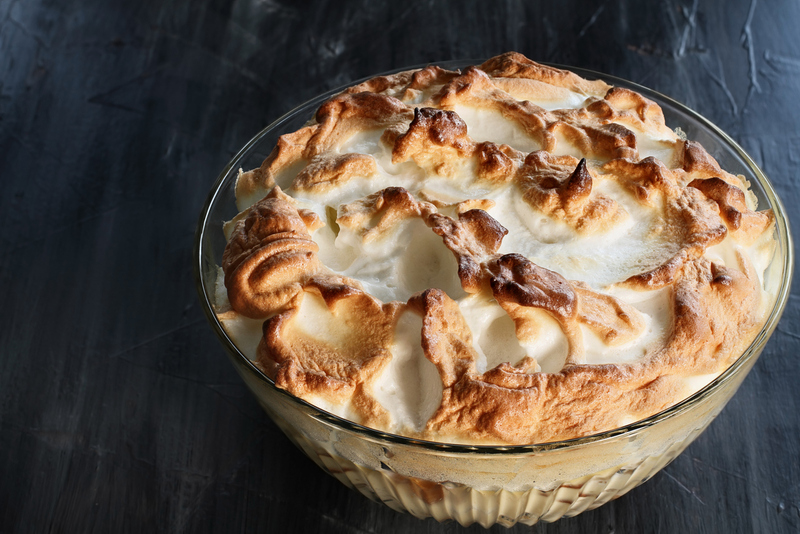 Check out our recipe below to learn how to make this delectable banana pudding with meringue. Begin making the pudding. Put the flour, sugar, and salt into a large saucepan. Separate your eggs, putting the yolks into a medium bowl and the whites in a separate bowl. Put the egg whites into the fridge along with the beaters of a hand mixer. Lightly beat the egg yolks and add the milk. Beat until the two ingredients are evenly combined. Pour the milk mixture into the saucepan. Heat the pot over medium-low heat, stirring constantly, until the mixture has thickened and become smooth. Remove the saucepan from the heat and stir the vanilla, about one minute. Slice your bananas about 1/2-inch thick. Begin constructing your pudding. Line the bottom of a 9×13 baking dish or an oven-safe glass bowl with 1/3 of your vanilla wafers. Cover the wafers with 1/3 of your sliced bananas. Pour 1/3 of your pudding over the sliced bananas. Repeat these steps to make two more layers with the remaining 2/3 of your wafers, sliced bananas, and custard. Now, to make the meringue, take your egg whites and hand mixer beaters out of the fridge. On a high setting, whip the egg whites until they become light and fluffy. Add the fresh lemon juice and beat a bit more. Gradually beat in the sugar. Mix them until the sugar has fully dissolved. The whites are finished when they form peaks after pulling the beaters out of the whites when the mixer is off. Spoon the meringue on top of the pudding in large dollops evenly spread out. Using a rubber spatula, spread the meringue evenly across the pudding, making sure to get it to every edge and corner of the dish. Bake the pudding for about 25 minutes or until the meringue has browned slightly. You know that when you put tasty, fresh ingredients into your dishes, it turns a good meal into an amazing one. When you’re preparing this recipe, be sure to use Sauder’s eggs! With our commitment to quality and freshness, you know you’re using something great. Be sure to use our store locator, so you can find our eggs at the nearest retailer to you! Receive email blasts about Sauder news and other useful info.